Clubs in organized leagues shake off the 'ice it and play' attitude toward injuries - including concussions. Coach Cesar Fragoso yells for the kids to stop. He walks over to a player and tells him what he did wrong. "You hesitated," he says in Spanish, loud enough for the rest of the team to hear. "You must play with decision. Don't hold the ball at your feet; other players are coming for you." The boy is turning red. "Touch the ball with a decision already made." The other players on Cuervos FC watch without looking away. None of them begins a side conversation. Fragoso drops the ball and returns to the sideline. Cuervos is a new team on the club soccer scene. Jose Alberto Vasquez is president of the Gresham club and recruited coaches like Fragoso, a former professional player in Mexico, to rally Latino athletes from unranked clubs, casually organized games between Latino kids in what's known as the "Barrio Leagues" or "Mexican Leagues" to compete against the highest-ranked teams in Oregon. Other clubs have Latinos on their rosters, but Cuervos' raison d'etre is Latinos. The Barrio League matches, complete with food trucks and mariachi soundtracks, provide a cultural experience and some very good soccer. "I grew up playing in the Mexican leagues," says Marco Farfan, left back defender for the Portland Timbers. "Taco trucks, music, I loved it." 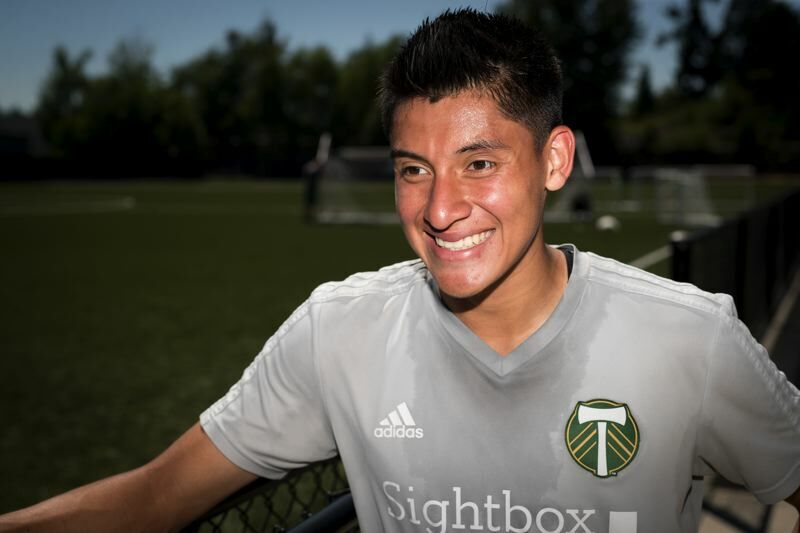 But the Gresham native, who was selected for Major League Soccer's Homegrown Game in Atlanta this week, says the emergence of teams like Cuervos offers young Latino players more options. "I think it's great," Farfan says. "Even though I came from Eastside Timbers, I root for teams like Cuervo," he says, laughing. One benefit of playing on a team like Cuervos may be greater attention to player safety. 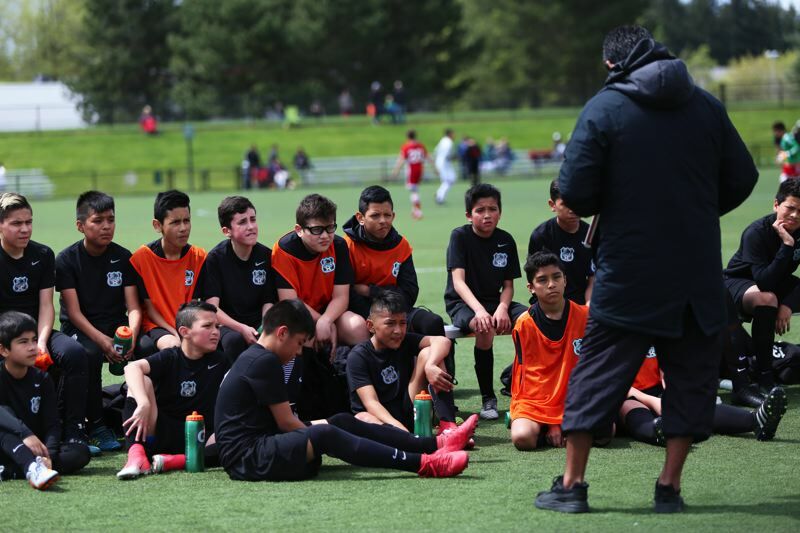 Like many of the best soccer teams in Oregon, Cuervos operates outside of the public school system, under the authority of the Oregon Youth Soccer Association. Such teams — which total more than 1,000 according to OYSA — are required to comply with Jenna's Law, state legislation passed in 2013 aimed at reducing head injuries in recreational sports. The law requires coaches to undergo annual training to help them identify the signs of a concussion. Vasquez and Fragoso had their training nine months ago, in Spanish. Parents and children are given information about concussions, the signs and dangers of getting them. "We sign these forms and give over our insurance information," says Rocky Munoz, whose son, Fito, plays for the team. The OYSA offers graded return-to-play guidelines as well as a fact sheet on concussions produced by Providence Health. It is available on its website and distributed to member clubs, like Cuervos. Vasquez says his coaches have concussion materials written in both English and Spanish. That kind of support is lacking in the Barrio Leagues, Farfan says. "When you're playing in a rec club and you get a concussion, you go with your parents to the hospital, and it's up to your family to handle it," Farfan says. "Here the trainers do everything. They have doctors who walk you through the whole thing." Farfan says he's had a few concussions. "The worst ones are where you aren't sure they're concussions, and you want to play. You think you can play, but (trainers) sit you down and say 'No, you aren't playing.' 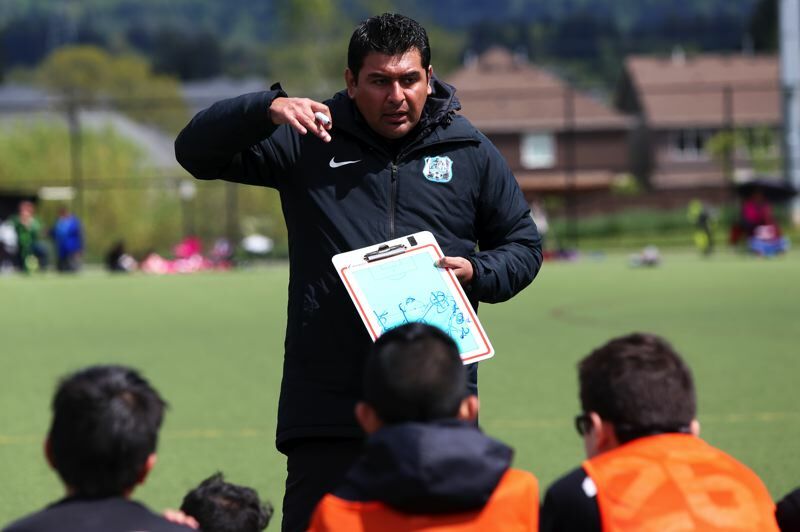 "
Fernando Pessoa, coach for the U-13 (for players under 13 years old) Timbers development team, says players may be more receptive to advice from a coach. "When a kid gets injured, they have to talk to the doctor and that can be uncomfortable," Pessoa says. "Part of our job as coaches is to help them mature, to talk about what's uncomfortable to talk about." Farfan says that's a change from the soccer culture he grew up with. "Growing up playing in those Mexican leagues, there was an attitude of 'ice it and you're fine, go play.' You know, parents would say 'séa valiente' " (be brave), Farfan says. "But I think it's changing; I think it's changing for the good." Vasquez says that kind of machismo, the stigma of boys being seen as weak for talking about injuries, is gone from today's game. "This generation is different." he says. "The kids tell César what they're feeling when they get hit." 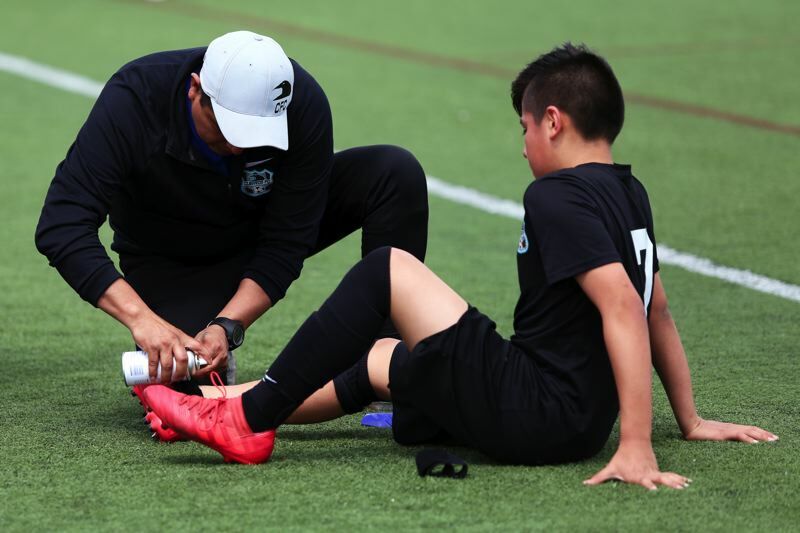 Still, there are a few studies that show young Latino athletes are less likely than other racial and ethnic groups to report having had a concussion, and that Latino parents view concussions less seriously than other parents. During a conversation about head injuries, which is conducted in Spanish, Vasquez does not use the Spanish phrase for concussion, which is "conmoción cerebral." Instead, he uses phrases like "golpe" or "daño a la cabeza" which mean hit or damage to the head, respectively. The formal translation is so rare that of the dozen or so parents, coaches and kids interviewed for this article, none of them used it. Still, regardless of the name, Vasquez says he understands the importance of recognizing and treating concussions. "We look out for signs like dizziness or nausea," he says. Munoz, the Cuervos parent, says he's not worried for his son's safety. "They tell us about (concussions)," he says. "It's a risk like in every sport. I trust them." 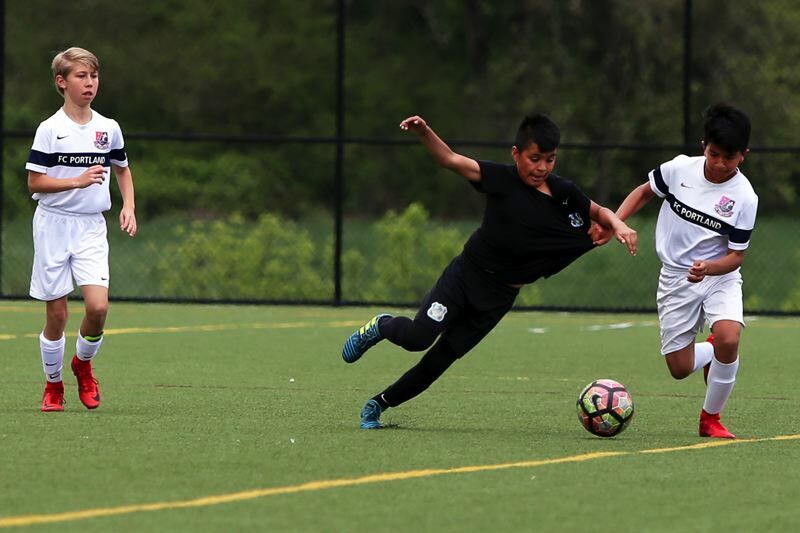 In competitive Oregon soccer leagues, like the one in which Cuervos FC competes, there is a procedure that inadvertently serves as a safety check for concussions. During the course of play, a referee may witness an impact to the head and call for that player to go into concussion protocol, forcing a substitution. 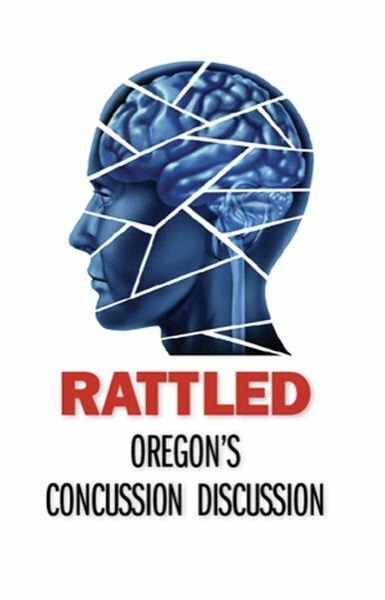 At the end of the match, all referees turn in their records of the games to the Oregon Youth Soccer Association office, noting things like yellow cards and, in this case, that a substitute came in for a player with a possible concussion. Software used by OYSA then flags that player as needing medical clearance to return to play, as required by Jenna's Law. When a club submits its roster for the next match, the software notifies the assigned referee of that player's ineligible status, preventing the player from entering the game. A club must submit a medical release to the league office before the software clears the player. The OYSA shared its data for the 2017-18 season, in which out of approximately 14,000 players, 21 were flagged by referees as having a possible concussion. Out of those, six were later diagnosed with a concussion. The most severe case resulted in a youth removed from play for three to six months.